This ultra-luxurious yet lightweight yoga mat features a non-slip, faux leather base and cosy fleece surface to grant comfort and reassurance – even during the most intricate of poses. Filled with pure dried lavender, the mat releases a delicate, relaxing fragrance as it’s used, making it the perfect base for any yoga or relaxation practice. Whether it’s yoga, meditation, Pilates or just letting go after a long day, Holistic Silk’s lightweight, ultra-luxurious Yoga Rug Mat makes the perfect base. Vegan friendly, it features a non-slip faux leather base – to keep it steady during even the most complicated manoeuvres – and a cosy fleece top to offer comfort and reassurance throughout your workout or relaxation. Filled with pure dried lavender, the rug mat releases a blissful aroma to instil a sense of calm and focus. Ideal for exercise, it’s available in two shades – precious silver and green-tinted jade – each finished with gleaming gold piping and intricately designed handles and ties. With its convenient, comfortable carrying harness, the mat can also be used for picnics and trips to the park, beach, or wherever you venture. Care: Amazingly you can wash your Yoga Rug Mat at 30 degrees in a standard washing machine. The lavender will gradually start to fade when you do this so we suggest sprinkling lavender essential oil where you like on the fleece to maintain the pleasant aroma. 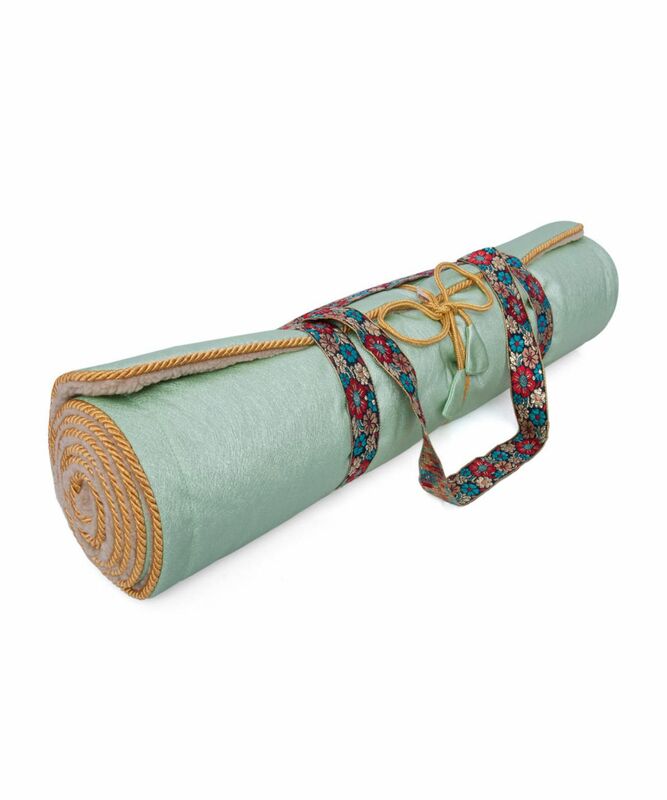 Each Yoga Rug Mat comes with a beautiful organza storage bag to make sure your Yoga Rug Mat is clean and safe whether you are home or away.